Guaranteed to not fog your glasses! Presenting the “Original” Dust Bee Gone Nuisance Dust Mask. Stop throwing away your money on uncomfortable disposable dust masks. 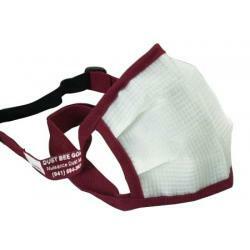 Category: Dust Bee Gone Nuisance Dust Mask. • Heavy 3/4″ elastic with a buckle provides strength and the top strap is easily adjusted. • Small (aqua) fits Children to age 6.